FromSoftware’s Sekiro: Shadows Die Twice has finally arrived and we’ve prepared a series of Guides to help new players, whether they are Souls veterans or not, overcome the steeper than usual learning curve of the game. In this Sekiro Beginners Guide, we’ll cover things like Stealth, Posture, Prosthetic Tools, Skills and much more. This is the first of 3 Guides on the subject of Sekiro’s mechanics, with Novice and Expert Guides coming later this week. The first thing we are going cover in this Guide is Stealth, and the role that it plays in Sekiro: Shadows Die Twice. Unlike Souls games, that are not really designed around a “sneak” element, Sekiro was created with this in mind from the very start. Let’s dive into this mechanic and see just how this works. 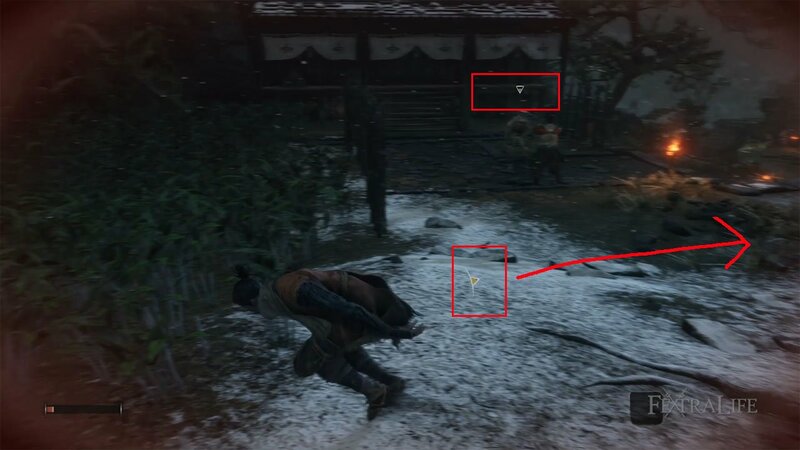 Stealth in Sekiro is not overly complicated, but it isn’t completely explained either, and enemies can see or hear you even while you are “crouched”. This is important to note, because you will need to keep an eye on their indicators to make sure you are not seen, unless you intend to be (YOLO!). Enemies will have a white triangle above their heads once you’ve moved into their detection radius, and it will slowly start to change to yellow if you remain in it. Once the triangle is fully yellow, enemies will be aware that “something is up” and will proceed to look for you. You can “lose them”, if you remain hidden long enough out of their detection radius, similar to Assassin’s Creed. However, should they spot you this triangle will turn red, and they will then attack you or even call for aid. These indicators help tell you what is happening. White outline with yellow center means you are being detected. Crouching helps reduce the noise you make and the amount that you are seen by enemies, and you can do this by pressing the left stick on the controller. Note that if you jump or use your Grappling Hook, you will not land crouched, but will need to click the stick once again. It is not required to be crouched in order to perform Backstab Deathblows, but it can help you perform them, by allowing you to get close to the enemy. Note that you can only use Backstab Deathblows before the enemy has detected you. Stealth can be improved via the Shinobi Arts Skill Tree where you can spend Skill Points to obtain the Latent Skills: Suppress Sound and Suppress Presence. 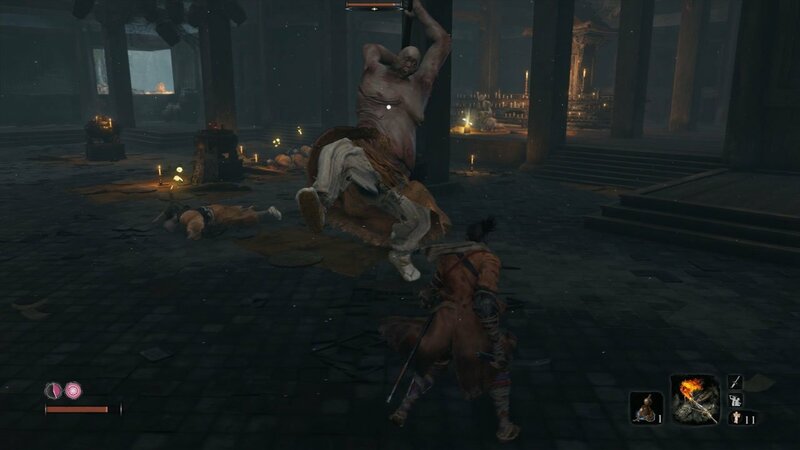 This Skill Line can be obtained very early in the game, and is given by the Sculptor after progressing a short ways into Ashina Outskirts. Suppress Presence and Suppress Sound can help keep you hidden from enemies. These will make it harder for enemies to detect you, and allow more room to maneuver without being seen. Be sure to pick these up if you’re having trouble remaining hidden, and be sure to check out our Stealth Guide for a more in depth analysis of Stealth. Every character in the game has a Posture Gauge that fills when they are struck with an attack, when they block and attack, when they deflect an attack or when their attacks are blocked or deflected. When a character’s Posture Gauge becomes full (flashes bright orange) they are vulnerable briefly to a Shinobi Deathblow. 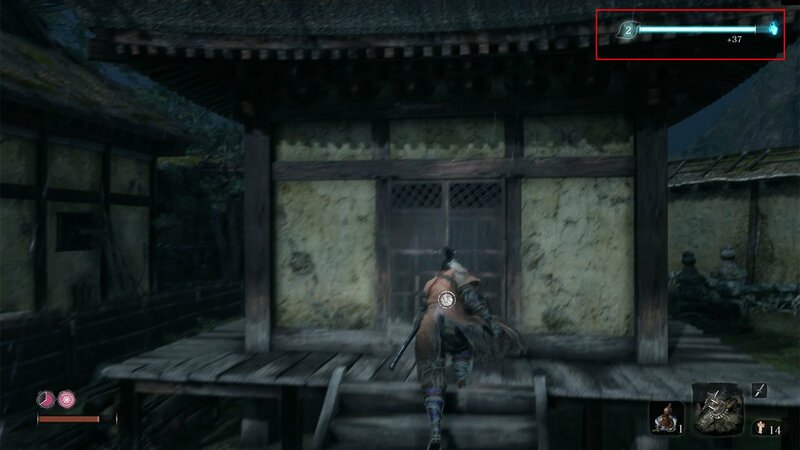 This includes Sekiro himself, so you will need to keep an eye on your own Posture Gauge as well. Note that your Posture will regenerate faster if you are holding block (L1), which is completely contrary to Souls games. In this image both of our Posture Gauges are full…it was tense. Filling an enemy’s Posture Gauge (and performing a Shinobi Deathblow) is the primary means of defeating enemies, and is the only way you can defeat Mini-Bosses and Bosses. Because an enemy’s Posture Gauge fills much faster when you deflect attacks than when you block or attack, you will need to learn enemy attack patterns in order to get the timing of these deflections down. Deflecting is done by pressing L1, which is the same button used to block, at the exact moment a blow would strike. The window is quite forgiving, and you can still deflect attacks even if your timing is off by a small amount. However, the more exact your timing, the less your own Posture Gauge will fill, and the more your opponent’s will. You can still defeat enemies by lowering their Vitality to 0, with the exception of Mini-Bosses and Bosses, as mentioned above. There are enemies in the game that take more Vitality damage than Posture damage when you attack, making this a valid strategy in many cases. In addition, as a character’s Vitality decreases, the slower their Posture regenerates. In some cases you will need to deal damage with attacks and deflect, in order to fill the Posture Gauge of your target. Note that a successful dodge fills neither the attacker’s or defender’s Posture Gauge, making it a useful, but less than ideal form of avoiding damage. 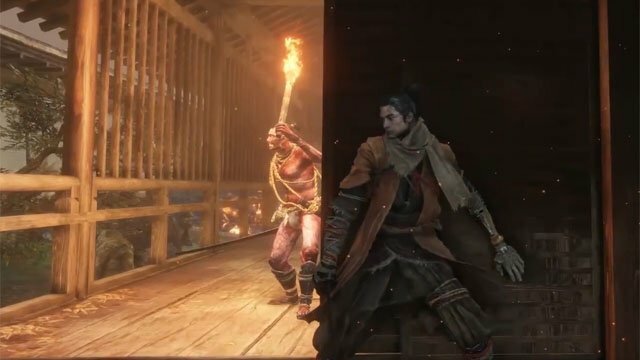 Sekiro: Shadows Die Twice features something called “Perilous Attacks” which occur when fighting more difficult enemies like Mini-Bosses and Bosses. You will know when they happen by the red Kanji that appears on the screen, and the distinct sound that you will hear. Depending on what type of Perilous Attack occurs you will be able to “Counter” it. Note that you do not have to Counter them, and that you can still deflect them or dodge them, but this is the ideal method of handling them. The red Kanji means you are in danger, so watch out for it and Counter when you can. Counters can be performed during Perilous Attacks, whereby the player does a special move at the right movement. These Counters don’t deal any Vitality damage to the enemy, but they deal significantly more Posture damage than a regular deflection, making them very important. Players begin the game being able to Counter “sweep attacks” by jumping over the enemy’s weapon and kick flipping off of their head. The Mikiri Counter can be unlocked from the Shinobi Arts Skill Tree and allows the player to Counter enemy “thrust attacks”. Later this can be improved to deal even more Posture damage when performed. Pressing the jump button again, after you’ve jumped over the sweep will perform this Counter. 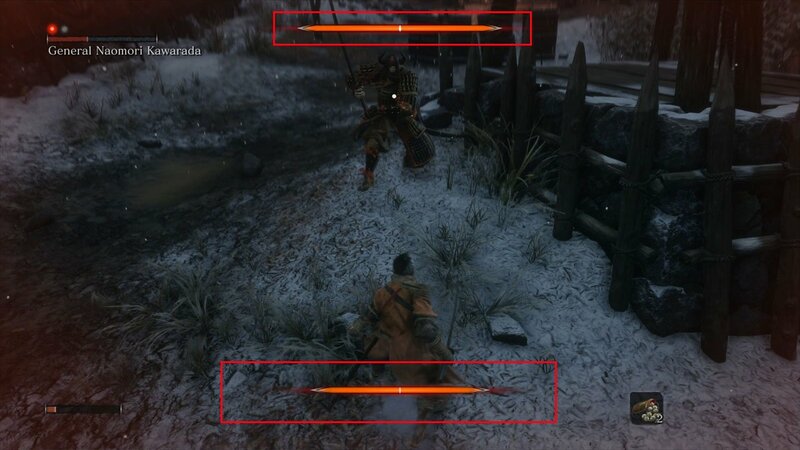 One interesting thing about these Counters is that should fill an enemy’s Posture Gauge by using one, you will be able to do a special Shinobi Deathblow that is unique to that Counter. These look insanely cool, and make you feel like a super badass if you pull one off. 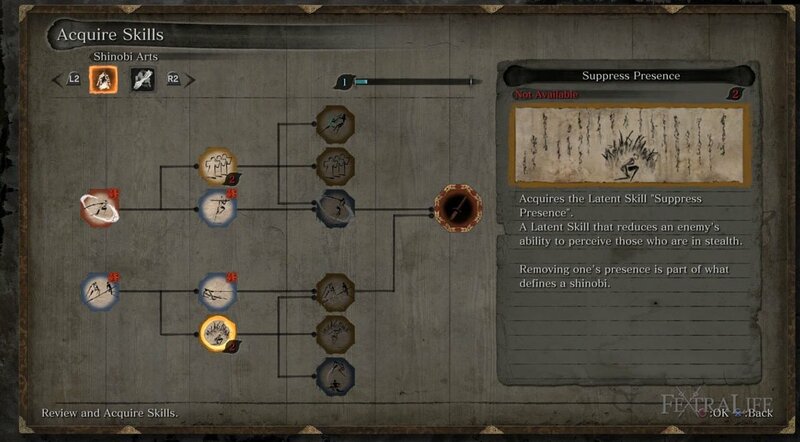 In Sekiro, part of player progression is unlocking Skill Trees and gaining Skills. Skill Trees are unlocked by finding Esoteric Texts, which are tied to doing specific actions, so please see the Wiki for the specifics. Latent Skills: Latent Skills are essentially “passive skills” that apply a boost of some kind, and do not need to be activated. For example, gaining more Spirit Emblems, or having a stronger Healing Gourd. Combat Arts: Combat Arts must be equipped by the player, and they can only have one Combat Art at a time. These can be changed at a Sculptor’s Idol, and more will be unlocked through out the game. These Skills have a redish background to their icon. Shinobi Martial Arts: Shinobi Martial Arts have a blue background on their icon, and they simply allow the player to perform more specific actions in combat. One example is the Mikiri Counter. You cannot perform it until you have acquired this Skill. Players gain Skill Points via killing enemies and filling the blue experience bar at the top of their screen. They are spent at any Sculptor’s Idol, and each Skill costs a certain number of points. It is highly unlikely that a player will be able to max out all their Skill Lines in one playthrough without intense grinding, so plan accordingly, and take only the ones you really want. This is what it looks like when you gain a Skill Point. Your bar flashes light blue for a moment. Through out the game players will be able to obtain Prosthetic Tools that they can use in combat. These are found in various locations of the game, so please see the Wiki for their exact specifics. Once you have obtained a new Prosthetic Tool, you will need to visit the Sculptor in the Dilapidated Temple in order to outfit yourself with it. Once finished, it will be added to your arsenal that you can swap out at an Sculptor’s Idol. Players can have up to 3 Prosthetic Tools equipped at once, and these can be cycled through on the fly during combat. 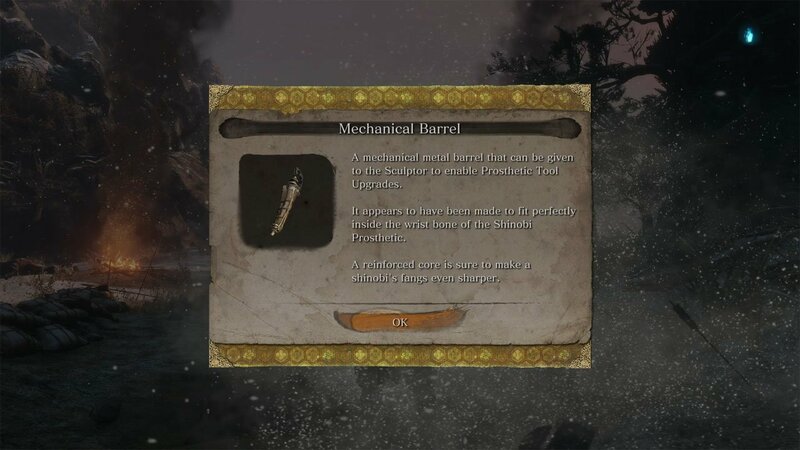 Prosthetic Tools can also be upgraded after you have obtained the Mechanical Barrel, by visiting the Sculptor once again, after defeating Gyoubu Oniwa. This will create new versions of already obtained Prosthetic Tools, that can be slotted alongside your existing ones. Note that in order to upgrade you must have located the basic version of the Tool first, this is usually the “Loaded” version. Once you defeat Gyoubu then you can upgrade your Prosthetic Tools. In order to use Prosthetic Tools in combat, you will need to have Spirit Emblems. These act as a refillable “currency”, much like mana in other games, that prevents the player from just spamming Prosthetic Tool attacks at will. Players can purchase Spirit Emblems from a Sculptor’s Idol, gain them from defeating enemies, or find them through out the map. Each Tool has its own cost, with some being much higher than others, so pay attention to this when selecting your Tools to equip. Also note, that excess Spirit Emblems are automatically stored for you, and will replenish when resting at a Sculptor’s Idol, much the way Blood Vials or Silver Bullets did in Bloodborne. 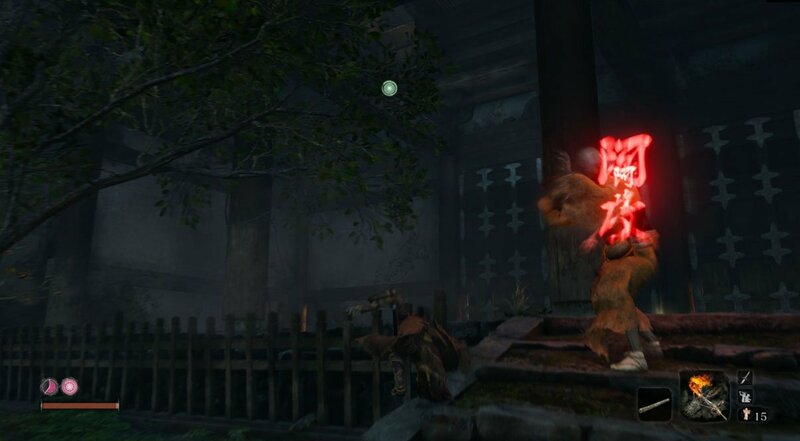 Through out Sekiro, you will die numerous times, often with the chance to Resurrect. You should do so any time that you can because if you really die then you will lose half of your current XP bar and half your Sen (gold). It does not matter whether you use Resurrection or not, you will always incur the penalty upon death and respawning at a Sculptor’s Idol. 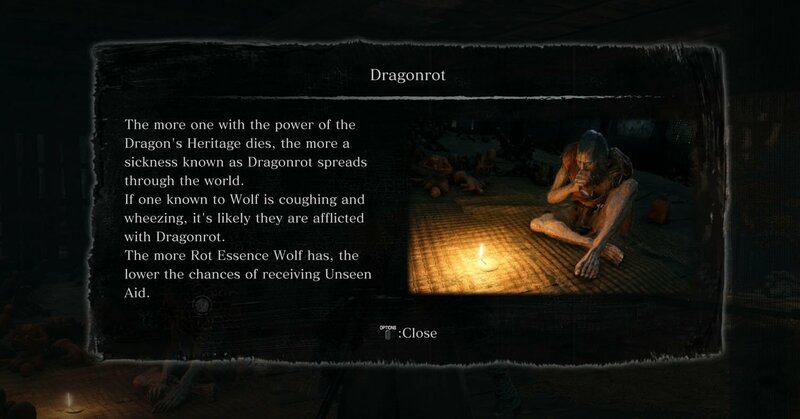 In addition, there is a chance you will spread Dragonrot to the game’s NPCs, making them sick and halting their quest lines. This probability is different for each of the game’s NPCs, so some are more likely than others to be affected. Note that the Sculptor will always be the first to get Rot Essence, and that your Unseen Aid will reduce for each NPC effected. Again, this occurs whether you use your Resurrect or not, so there is no reason not to use it. You can clear Dragonrot, but it’s not easy to do. Unseen Aid prevents the player from losing XP and Sen after dying and respawning at a Sculptor’s Idol, whether they used Resurrect or not. There is a default chance of 30% to receive Unseen Aid, which will be reduced significantly when the Sculptor is affected, and each subsequent infection will reduce your chance of Unseen Aid by a certain percentage. Note that it would seem that you cannot increase your Unseen Aid past 30%. Stay tuned for more Sekiro coverage as we cover things a Novice and Expert need to know about the game, and publish a few Build Guides as well. Be sure to check out the Sekiro Wiki for all your needs, and join us on Twitch to see us live in action!